The Year of Resistance, Inc. Throughout 2017, business leaders wagged their fingers at Trump with one hand while quietly accepting handouts with the other. It’s been a hell of a year for the #Resistance. Donald Trump hadn’t even been sworn in before enterprising hucksters realized they could cleanse their sins by simply expressing distaste for a president who winked at neo-Nazis. So it was that neocons like David Frum, Bill Kristol, and Max Boot were no longer odious warmongers, but principled intellectuals fighting for the survival of the republic. That Jeff Flake and Bob Corker weren’t just guys who voted for Trump’s policies and nominees almost all the time, but brave leaders who dared to say some disapproving things about their party’s leader. That George W. Bush was no longer a war criminal who plunged the Middle East into chaos, but a wise elder statesman who got an unfair rap while in office. This phenomenon wasn’t just limited to politicians and media commentators. Wealthy business leaders and large corporations also realized that being superficially anti-Trump — issuing symbolic condemnations while both supporting Trump-like policies and engaging in Trump-like business practices — was clever branding that was good for the bottom line. As the year wraps up, let’s take a look back at some of the corporations that dared to take a stand in 2017 — and why we shouldn’t fall for their opportunistic acts of soft denunciation. Back in 2015, as Trump’s campaign was still ramping up, Expedia chairman Barry Diller called the real-estate mogul a “self-promoting huckster” with a “vein of meanness and nastiness,” and pledged to “either move out of the country or join the resistance” if he won. He dutifully gave more than $760,000 to Clinton in 2016. Before this expression of defiance, Expedia was best known for using a variety of underhanded business practices, such as offering fake discounts and making false claims about room availability and customer interest, to pressure customers into booking rooms. In 2011, it was hit with a $486,000 fine for misleading marketing, and, just this month, the British government launched an investigation into Expedia and other online travel agencies. For years, Expedia resisted attempts to make it and the airlines it worked with disclose their fees, only changing its tune once new Transportation Department rules forced its hand. This was after the company spent tens of thousands of dollars lobbying against such rules, as well as for a bill that consumer groups charged would have misled customers about the real price of airfares. But good news for Diller: Expedia’s lobbying efforts, which extended into this year, seem to have paid off, because earlier this month the Department of Transportation dropped its proposed rules to make Expedia and similar sites disclose airline baggage fees. This is in addition to the lobbying Expedia did on occupancy tax, aviation sales tax, state and local taxes on online purchases, and “corporate tax reform.” It’s a safe bet the company wasn’t lobbying for higher taxes. Diller also briefly sat on the board of Ticketmaster, renowned for its price gouging and huge fees, and continues to sit on the board of Coca-Cola. Barry Diller and Expedia — tru icons of the resistance. In addition to Dropbox’s aversion to bigotry, readers should probably also be aware that the cloud storage company has been accused by NSA whistleblower Edward Snowden of being “hostile to privacy” and “a targeted you know wannabe PRISM partner,” a charge to which Houston responded by meekly referring to a “trade-off between usability, convenience, and security.” Snowden, it seems, wasn’t far off the mark. To be fair, Houston has talked about Dropbox’s commitment to surveillance reform, and Dropbox has lobbied on the issue. But that’s also why he had a lot of explaining to do when Dropbox added former secretary of state Condoleezza Rice to its board in 2014, where she remains to this day. Rice had publicly defended Bush’s warrantless wiretapping program in 2005, explaining that the “war on terror” was a “different type of war” that necessitated such powers, as well as authorizing spying on United Nations security council members in the lead up to the Iraq War. Where to start with these three? Mark Zuckerberg, the boy king in waiting who founded and runs Facebook, has taken a handful of admirable political stances since Trump took office, including opposing his travel ban, his transgender troop ban, his anti-immigrant rhetoric, and his actions against Dreamers, leading the president himself to label the company “anti-Trump.” The CEOs of Apple and Google have made similar moves. But none of this should make us forget the triumvirate’s unsavory histories. Many liberals will tell you that Zuckerberg’s greatest crime was helping get Trump elected, something he didn’t actually do. Instead, we should remember Facebook’s actual litany of offenses: its secret psychological experiments on users, its years of collusion with surveillance agencies, its relentless collection and sale of intimate data about our lives, its opposition to legal restriction of such activities, the psychological manipulation and addictive elements built into its interface, its enabling of discriminatory advertising to its users, and its support for the pro-corporate Trans-Pacific Partnership (TPP). With the exception of human experimentation (at least as far as we know), all of this applies to Google and, to a lesser extent, Apple. To that list we can add the appalling way these companies treat their non-salaried workers. Facebook’s contractors, including cafeteria workers, janitors, and bike mechanics, don’t receive the perks that the company’s salaried workers do and are forced to take up second or third jobs and reduced to living in cars and garages. Ditto with Google — which was at one point sued for not paying a contractor overtime and firing him after he asked for more hours — and Apple, whose Chinese factory is such a hellish sweatshop that workers started killing themselves out of desperation and then turned suicide into a protest tactic. Facebook also spent, by my calculation, nearly $9 million on lobbying this year, while Google shelled out around $14 million and Apple went through more than $6 million. All were keenly interested in tax reform. And the investment seems to have paid off: the GOP tax plan slashed the corporate tax rate from 35 percent to 21 percent and set up extra low rates for offshore profits repatriated to the United States, a boon for all three companies. Lyft’s sales pitch this year has been that it’s the socially minded alternative to Uber. “We’re woke. Our community is woke, and the US population is woke,” its president, John Zimmer, told Time in March. Zimmer’s words came on the heels of Uber’s disastrous decision not to join New York’s taxi drivers in suspending its services in solidarity with protesters demonstrating against Trump’s travel ban, two days after which Lyft cannily donated $1 million to the ACLU and condemned the order. The Justin Trudeau of ride-sharing services, Lyft’s calculated social consciousness crumbles upon the barest of scrutiny. Trump ally and transition team member Peter Thiel is a direct investor in the company, while Icahn Capital, the firm of Trump’s former deregulatory advisor Carl Icahn, has an appointee on its board of directors. If that’s not enough, the same labor issues that make Uber such a raw deal for workers — lack of health insurance, minimum wage, overtime, paid leave, and other benefits — are also features of Lyft. Or just recall the time the company proudly touted a story about one of its drivers working as she went into labor. Or that it cut drivers’ pay the day after Trump’s inauguration. Or that, together with Uber, it fought a Seattle law that allowed their drivers to unionize. This may come as a surprise given that for decades Nike was known as one of the worst corporate actors. The company has since tried to mend this reputation, touting its commitment to sustainability, carrying out hundreds of thousands of chemical tests, joining the Fair Labor Association, publishing reports on conditions at its factories, and opening plants up to auditing. Still, old habits die hard: Greenpeace designated Nike a “greenwasher” in 2015 due to the presence of toxic chemicals in its products, while undercover activists in 2011 found it was using suppliers who dumped dangerous chemicals in China’s rivers. It has also begun facing renewed accusations of sweatshop conditions at its factories, from mass faintings and wage theft to physical abuse. At the same time, Nike has lobbied the government on the corporate tax rate and repatriation and spent tens of thousands of dollars successfully pressing the Oregon legislature for a special bill granting it “tax certainty” for thirty years. The one issue on which it’s meaningfully opposed Trump? The TPP — which it supported, in dollar terms, more than other company. Then there’s the laundry list of additional accusations lobbed at the company over the past two decades, including (to name but a few) passive support for the dictator of Swaziland, complicity in anti-union violence in Guatemala and Colombia, and selling pesticide-contaminated drinks and causing water shortages in India. Even without the string of racial discrimination suits it’s faced, this exploitation of the Global South would be enough to render its symbolic commitment to diversity meaningless. Over the years, Coca-Cola has lobbied on a host of issues, most commonly against government regulations on sodas and on promoting exercise as a solution to obesity. A 2017 study in the American Journal of Preventive Medicine also found that between 2011 and 2015, the company fought twenty-nine health bills aimed at improving nutrition and reducing soda consumption, and successfully pushed to remove a ban on BPA — a harmful chemical Coke puts in the lining of its cans. Trump would be proud. But how committed is Goldman to preventing climate change, really? The bank certainly aims to make money off the climate crisis, both by investing in “market solutions” to it and through buying up “catastrophe bonds.” Even so, it spent most of this year painting Big Oil as an attractive investment, including as recently as two weeks ago. Since 2000, it’s lobbied with other Wall Street firms to weaken regulations on oil futures, partnered with Post Oak Energy Capital to invest $100 million in a new oil and gas company, and created a fracking company through its merchant banking division. The quiet collusion with Trump’s agenda hasn’t ended there. The bank has, unsurprisingly, spent years and a fortune lobbying on tax issues, the fruits of which is the GOP tax bill. And it would profit handsomely from the infrastructure privatization plan its former executive has been pushing in the White House. You know the world’s gone topsy-turvy when a pharmaceutical giant becomes the world’s social conscience. In August, Merck CEO Kenneth Frazier, the sole African-American member of Trump’s Manufacturing Advisory Council, quit the position over Trump’s post-Charlottesville comments, saying he felt “a responsibility to take a stand against intolerance and extremism.” His departure prompted the CEO of another pharmaceutical giant, Johnson & Johnson, to also bravely bow out after Trump had already dissolved the panel. Of course, Frazier could have taken a stand against intolerance and extremism earlier, perhaps by quitting after Trump introduced his racist travel ban, or, say, not joining the council in the first place. But even so, Frazier’s bare-minimum corporate activism was undermined by Merck’s history, which includes putting out a drug that it knew dramatically increased the risk of heart attacks and strokes, then paying an academic publisher to produce a fake peer-reviewed journal that promoted the drug. There’s also the fact that Merck, like most big pharmaceuticals, helped water down Obama’s health care reforms back in 2009, trading its support for the Affordable Care Act for White House promises to do away with Medicare drug price bargaining and importation of cheaper drugs from Canada and Europe, which would have cut into the industry’s profits. (At that point, Merck had raised its prices 8.9 percent over the year.) Merck subsequently shelled out more than $1 million to lobby on, among other things, drug importation and corporate tax reform. Frazier himself is the treasurer of the Pharmaceutical Research and Manufacturers of America (PhRMA), the industry’s lobbying arm that sponsored, and was represented on the board of directors of, the right-wing group ALEC. When a health care consumer advocacy nonprofit started gathering signatures for a ballot initiative that would have compelled drug makers to give 6 to 10 million Californians a discount in 2005, PhRMA leaped into action to aggressively defeat it, as it has done for other similar ballot measures since. Merck alone spent $7.2 million last year to defeat a ballot measure that would have limited how much public benefit plans in the state paid for prescription drugs, almost as much as the measure’s proponents had raised. This may be the most galling one. At a superficial level, Jamie Dimon, the head of JP Morgan Chase, is another corporate leader who’s experienced a moral awakening following Trump’s Charlottesville comments. But don’t think the dissolution of the group and Trump’s sympathy for white supremacists closed off Dimon and Chase’s ability to collaborate with Trump. Just this year, Chase lobbied the government — and at times the White House and the office of the vice president directly — on “financial service related issues,” “tax-related issues,” “corporate and international tax reform,” “settlement agreements with federal agencies,” the Financial CHOICE Act, “financial services regulation,” and “the implementation of the Dodd-Frank Wall Street Reform and Consumer Protection Act.” This lobbying also extended into the year’s third quarter — in other words, likely after Dimon’s break with Trump — and once the fourth quarter results are filed, it’ll almost certainly show it continued to the end of the year. What was the result of this lobbying? In June, the House passed the Trump-backed Financial CHOICE Act, which repealed most of the key aspects of the Dodd-Frank financial reform law. The same month, Trump’s Treasury Department released a plan for overhauling financial regulations that led a Financial Services Roundtable representative to remark that it was “the first time in a while where there’s been an official undertaking where our concerns resonated with the folks in the driver’s seat.” Trump’s pick to head the Consumer Financial Protection Bureau plans to radically change the agency’s direction. And of course the GOP tax law will give banks like JP Morgan Chase a huge windfall, which is why Dimon himself praised it. 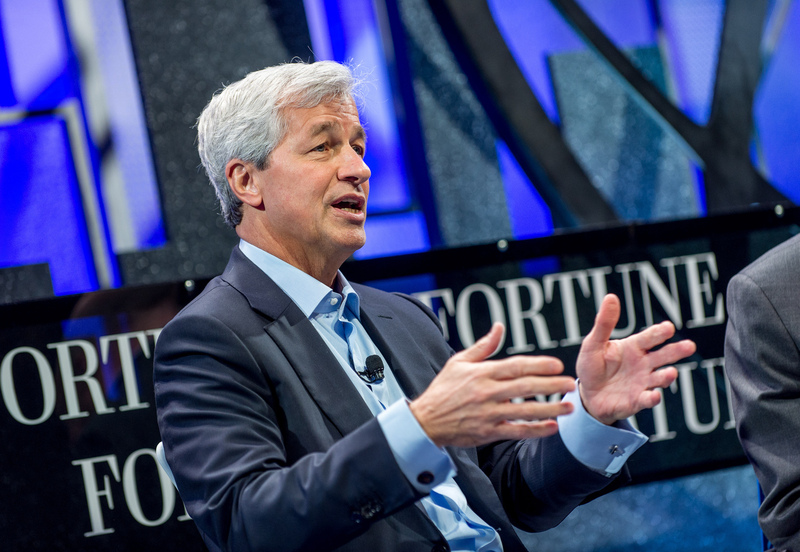 Last December, Dimon also became the chairman of the Business Roundtable, which, during his tenure, lobbied on class-action lawsuits, “pro-business comprehensive tax reform,” clean air regulations, the Financial CHOICE Act, “regulatory burdens on US energy production and development,” and the GOP’s attempt to repeal Obamacare. Far from opposed to Trump, these are all core elements of his agenda. Finally, it bears mentioning the bank’s role in the 2008 financial collapse, which, for all of Dimon’s recent nice words about bigotry and “diversity and humanity,” disproportionately harmed African-American communities. JP Morgan Chase in particular engaged in breathtakingly racist practices during this period, including charging black and Latino mortgage borrowers higher interest rates and fees, engaging in predatory lending that ensnared minority borrowers in risky, high-interest home loans they couldn’t possibly afford, refusing to refinance home loans for those borrowers on the same terms they gave to white borrowers, and moving minority homeowners into foreclosure at a more aggressive rate than white homeowners. On a good day, large corporations may denounce Trump’s white supremacist rhetoric. But they will never actually be a genuine source of opposition to the president and GOP’s agenda because their interests are fundamentally similar. They’re part of the same money-infested swamp that the administration and its allies wallow in. One needs only to consult the preceding list of corporations and business leaders, who wag their fingers at Trump with one hand while quietly accepting handouts from him with the other. As we roll into 2018, let’s finally leave behind the idea that the resistance to Trump is a movement that can encompass everyone from poor communities of color to banking CEOs. Taking on Trump will also mean taking on the corporate interests who not only benefit from his policies, but engage in corporate malfeasance that rivals anything the administration’s carried out so far. Forget starting to regularly jog again — let’s make that our new year’s resolution.